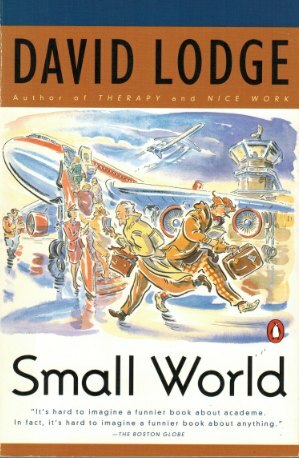 Until the beginning of this year I knew of the MLA principally through David Lodge's novel Small World (1984), in which Philip Swallow of Brummidge University (recognizable as the University of Birmingham), Morris Zapp of Euphoric State University (recognizable as Berkeley), and others, attend an MLA meeting. MLA is an acronym for the Modern Language Association of America. But, as with the United Kingdom which is neither united nor a kingdom, the words don't mean what they say. As David Lodge points out in his novel, when the words say "Modern Language," the Association is not really concerned with language but with literature, mostly literature in English. As well as that, although "Modern" could refer to something written recently, it could equally refer to Beowulf, written a thousand years ago. Also, MLA doesn't usually mean the Association, but the Association's annual meeting, which is held in a big city and attended by several thousand people at the beginning of each year. It runs over four days, with more than 30 sessions in parallel on a bewildering array of topics. It's where young people who have just received their PhDs in literature interview for jobs, where assistant professors look for jobs as associate professors at better universities than the ones that they are currently at, and where scholars who are established can be lauded. I was very pleased to be invited to the 2013 MLA by Patrick Hogan, to present some the work we do on the psychology of fiction. There at the conference, too, were some people whom I am very glad to know, who run the MLA Division on Cognitive Approaches to Literature. Since these approaches have begun, I have been hoping that they would become rather prominent. This hope has been encouraged by David Lodge himself having written both a novel, Thinks (2001), and a theoretical piece (2002), about cognitive approaches to literature. But this movement has, I am sad to say, not yet completely filled the vacuum left by the demise of post-modernism. The MLA meeting that is depicted in Small World is held in New York, and its big event is a session on "The Function of Criticism." In it Philip Swallow says that this function is to assist in the function of literature itself, which is to enable us to live more fully, more finely. Michel Tardieu says that the function of criticism is not to offer interpretations, but to understand the structural laws that allow literature to be produced at all. Siegfried von Turpitz says that Tardieu's project is doomed to failure because works of literature come into existence only in the mind of the reader. Fulvia Morgana says that the function of criticism is to wage war against the very concept of literature, because it's an instrument of bourgeois hegemony. And Morris Zapp says that this function is to reach no conclusion whatever because to read literature is to subject oneself to displacements of curiosity and desire endlessly from one sentence to another. In the 30 years since Small World was written, structuralism has become post-structuralism, but some streams of criticism depicted in the novel are still recognizable. Noticeable additions have been made, especially of minority and post-colonial literatures. The main big event that I could find in the 2013 MLA meeting, held in Boston, was of a panel in which three distinguished literary scholars spoke on "Why teach literature?" The first of these scholars was Patricia Yaeger whose title was "The embodied classroom." I was interested that, apart from Mark Doty, a poet, the people whose work she drew on were psychologists and philosophers. One was Christopher Bollas (see e.g. Bollas, 2011) a Winnicottian psychoanalyst who has proposed that literature can be "a holding environment," and a "transformational object." Yaeger went on discuss the work of the cognitive theoreticians Andy Clark and David Chalmers, who have developed the idea of the extended mind. Teaching literature, she said, offers conditions for extending the mind, and for distributing cognition. The second scholar was Jean-Michel Rabaté who called his talk "Why teach what you already know?" He concentrated on a 1955 dispute between F.R. Leavis and Clement Greenberg. He disagreed with Leavis's proposal that literature can enable us to become better people, and agreed with Greenberg that it only explains what we already know. I wanted to ask why achieving such explanations did not, in itself, enable us to become better people, but I didn't get the chance. The third scholar was Helen Vendler who entitled her talk "Why teach? Why literature?" She was the person I really wanted to hear, because I am an ardent admirer of her 1997 book on Shakespeare's Sonnets. She said that literature is often taught in courses on the great books, and that these courses are about the history of ideas. But really, she said, the generative force of literature is not ideas but emotions. So, once again, here seemed to be a plea for a rapprochement of psychology and literature. Bollas, C. (2011). The Christopher Bollas reader. New York: Routledge. Clark, A., & Chalmers, D. (1998). The extended mind. Analysis, 58, 7-19. Lodge, D. (1984). Small world. London: Secker & Warburg. Lodge, D. (2001). Thinks. London: Secker & Warburg. Lodge, D. (2002). Consciousness and the novel. In D. Lodge (Ed. ), Consciousness and the novel (pp. 1-91). Cambridge, MA: Harvard University Press. These are great topics and questions -- wish I could have been there to listen to the speakers. "True teachers do not provide knowledge as a benefit to their pupils; they treat their pupils as a benefit to knowledge. Of course they love their pupils; but they love knowledge more. And their over-riding concern is to pass on that knowledge by lodging it in brains that will last longer than their own. Their methods are not 'child-centred' but 'knowledge-centred', and the focus of their interest is the subject, rather than the things that might make that subject for the time being 'relevant' to matters of no intellectual concern. "What does it benefit ordinary children that they should know the works of Shakespeare, acquire a taste for Bach or develop an interest in medieval Latin? All such attainments merely isolate a child from his peers, place a veil between his thinking and the only world where he can apply it, and are at best an eccentricity, at worst a handicap. My reply is simple: it may not benefit the child not yet, at least. But it will benefit culture. And because culture is a form of knowledge, it is the business of the teacher to look for the pupil who will pass it on." Moving from the sublime Bach to the less exalted realm of popular culture, it occurs to me that among the romance novels I've been reading/studying there are a few which are metafictional and explore the impact which fiction can have on readers (or viewers in the case of films). I wonder if metafictions of this kind might help effect "a rapprochement of psychology and literature," at least to a small extent. Thank you, Fabio, for your comment, and for these quotes. These are thought-provoking ideas. As a teacher, I certainly thought I was passing on knowledge, and as I get older, the idea of passing it on to the next generation comes to seem more and more relevant and important. The idea of culture is interesting. It is to be distinguished from society, which is a collectivity of people; culture is a system of ideas, knowledge and practice. And being able to contribute to that, even by just a little bit, seems like a worthwhile activity. Thank you Laura for your comment. I know your subject matter is romance and its readings, and I am fascinated to hear that there are metafictional romances. I did not know that. The idea that these are contributing to a rapprochement between psychology and literature is very appealing. "I am fascinated to hear that there are metafictional romances. I did not know that." There are quite a lot of them, albeit some might be better described as having metafictional moments. Chapter 3 of my book, For Love and Money, discusses a selection of them. I was more focused there on metafictional novels/moments which shed light on cultural attitudes towards romances, and on the ways in which romance authors draw on, and refer to, works of "canonical" literature. However, I've recently been thinking about the way some romances explore the relationships between writers and the texts they create, and between readers and the texts they read. At the moment I don't know enough about psychology to be able to apply its insights to these texts but I'm hopeful that if I keep up with what you're all doing here at OnFiction I may one day have a better idea of how to go about it. Thanks very much, Laura, for the reference to your book For Love and Money. I'll look out for it. And the idea that you are thinking about romances in relation to the relationship between their writers and readers is very appealing. You might want to get in touch with Rebecca Wells-Jopling, in the OnFiction group, who specializes on relationships between readers and the writers they imagine to have written what they have been reading.